Imagine you could do something in your 50s to cut your risk of developing dementia and Alzheimer’s… by an extraordinary 88%. Well a study published recently says you can! Here’s the amazing discovery. . .
We’ve known for a while there’s a strong link between exercise and brain health. And now the results of a 44-year study from Sweden provide powerful new evidence. It shows that your level of physical fitness in middle age makes a big difference in your risk for cognitive decline when you’re older. The study started in 1968 and followed 191 women for more than four decades. The average age of the women when the study began was 50. At the start of the study, researchers had the women ride an exercise bike to measure their level of physical fitness. The women were connected to an electrocardiogram (EKG) that took readings as they rode the bike. The researchers also measured each participant’s heart rate and blood pressure. Then they assigned each person to a group based on their level of cardiovascular fitness. Of the 191 study participants, the bike test showed a little over 22% of them could be classified as “highly fit.” Another 48% fell into the “moderately fit” category. And 31% of the women – nearly a third — fell into the lowest fitness group. In fact, some women in this category weren’t even able to finish the bike test. Then between 1974 and 2009, the women were tested six times to see if they had developed any symptoms of cognitive decline. By the end of the study, nearly one out of four had developed dementia or Alzheimer’s disease. And the researchers were shocked when they saw which test group these women fell into. Without a doubt, there was a direct link between the women’s fitness level at middle-age and their brain health when they were older. A full 45% of the women who weren’t able to complete the bike test in their 50s went on to develop dementia or Alzheimer’s. Out of the whole low-fitness group it was 32%. And from the moderate fitness group it was 25%. But only 5% of the women in the highest fitness level group experienced cognitive decline. That means the women in the moderate fitness group were five times more likely to developdementia than the high fitness group. That’s astounding! 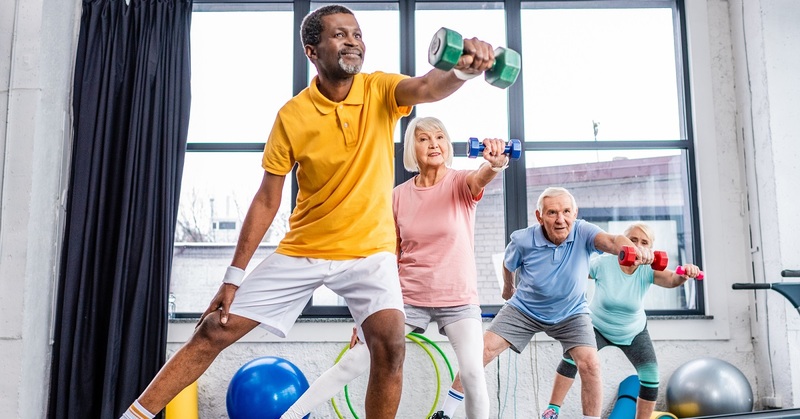 Maybe you can remember the old song that began “If I could save time in a bottle. . .” Well, if exercise could be put in a bottle and sold as pills, it would be the best dementia-prevention medication on earth. And here’s something even more surprising. The women in the high fitness group developed symptoms an average of 9.5 years later than women in the moderate fitness group!1 This means that not only did a very small number of these people get dementia but they developed it at a far more advanced age. In a much larger study, researchers looked at Medicare claims that were submitted between 1999 and 2009. To be included in the study, the claim had to be from a person at least 65 years old on December 31, 2009, and their medical records had to show results of an exercise test in 1971 or earlier. The researchers found 19,458 men and women who fit these criteria. So, if you’re in your 50s and you’re wondering whether you’re likely to get Alzheimer’s, look in the mirror and ask yourself if you rode a bike, swam, played tennis or golf or a least took a walk in the last few days. How can exercise have such an extraordinary impact on dementia and Alzheimer’s? One explanation might be brain derived neurotrophic factor (BDNF). BDNF is a protein that’s vital to our brain health. And low levels of BDNF are common in Alzheimer’s patients.3 This makes sense because BDNF plays an important role in our memory. It keeps our neurons and synaptic connections healthy, and it helps our brain create new cells and neural connections, no matter how old we are. And people who exercise have higher BDNF levels. In fact, it’s one of the few things known to increase BDNF. Researchers compiled data from 29 studies and found that, across the board, exercise increases BDNF. I’m not one to gush, but this news is incredibly exciting! With dementia and Alzheimer’s on the rise, and no drug in sight, it’s great to know there’s something we can do to help prevent these conditions in the first place. And by the way, exercise also reduces the risk of cancer and heart disease. As far as I’m concerned, it doesn’t matter how old you are. Your health and wellbeing will improve any time you exercise.